We first saw these magnificent pigs at the Beamish Museum and I fell in love with them instantly. Tim ( who's family have been farming for over 500 years) thought at first they were a strange breed of sheep, from a distance. They were very vocal and enjoyed all the attention they were getting. We came home and immediately I started researching these wonderful animals and their history. The more I read, the more I wanted them. But it had to be done properly. We sourced the best stock we could and started building up our own breeding herd. Whilst these pigs were distributed throughout the UK, the bloodlines and colours were specific to certain areas. If there was a disease outbreak in a specific area, many would be lost forever, so they needed to be conserved. We opted to locate the rarest and then have a "closed herd", so the bloodline would be secured for the future and stock could be replenished if needed. We now have the largest pedigree herd in the UK and the only one in Yorkshire. We strive through selective breeding to produce the best marbling and fat available in the UK. 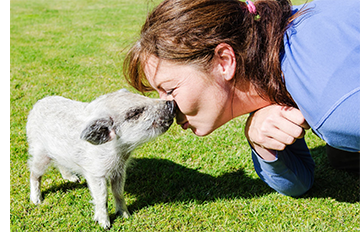 We are passionate about the breed and about animal welfare standards. We work with Royal Veterinary College in London and regularly have students come to learn about our pigs and see our ways of farming compared to those that exist with factory farming. In 2015 we were asked to take part in TV series for Channel 5 called "The Yorkshire Vet" and our pigs, particularly Monica, have become celebreties. They even got a mention and photos in Julian Nortons' book, "Horses, Heifers and Hairy Pigs". 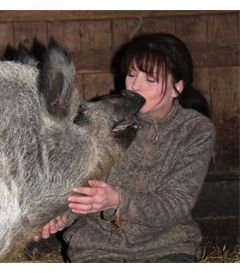 We receive worldwide orders for our magnificent pigs, both for breeding stock and for meat.